Demo Refresh: If you have tried Corona before and your 45-day trial expired, you will be glad to know we have automatically refreshed the demo period to give everyone an extra 14 days! Simply download and install 1.6 from the link above, and you can activate the refreshed demo period right from within Max. Enjoy! Just before we delve into the 1.6 features in detail, we want to share the latest company news. We’re pleased to welcome Standa to the Corona team! He’ll be working on the integration of Corona into SketchUp, so that development can start in earnest. It’s important to us that we handle development for any platform completely in-house – while that means it takes time to find quality developers like Standa, it pays off in the long run by assuring the quality of the integration, and ensuring we can give you the same level of support, communication, and feedback no matter what 3D software you use. Development here is picking up too! The integration has been keeping pace with the development of 1.6, with the features from the 1.6 daily builds making their way into the C4D daily builds. The first Corona Academy session took place in November of last year (see snapshots from the event! ), and the next will be happening at the end of April – already fully booked of course! You can read more about Corona Academy, and register your interest in future Academy courses here. We’re also seeing the first courses from Corona Primary Certified Instructors, such as State of Art Academy – we’ll also be posting those on the main Corona Academy website too. Greatly improved sampling of HDR environment maps with significant contrast (for example, with a baked-in sun). Renders using such an HDR environment map should now have up to half the noise for same render time (in other words, will render twice as fast). New Stratified random sampler reduces noise for all scenes. The CIE user interface is inspired by the Corona VFB, sharing its look and feel. It offers rich and fast post-processing options for Corona EXRs saved from the VFB: LightMix, full-featured denoising, tone mapping, LUTs, bloom and glare, curves, blur / sharpen, vignette, etc. CIE has lower system requirements than working with an image inside any 3D software – it is not necessary to have a scene loaded while you are working with your images, so you can denoise Corona renders outside of the rendering process, reducing the memory requirements significantly. All LightMix and post-processing settings can be easily shared between the VFB in any host application and the CIE.
No need to copy settings manually: EXRs from the VFB are automatically loaded with them. It also works with regular, non-Corona EXRs (in Float format). It is possible to add bloom and glare to them, apply your tone mapping settings, LUT, etc. Denoising and LightMix are not available for such EXRs because they miss the necessary “hidden” auxiliary data. Supports drag-and-drop to quickly load the images. Saves to EXR, PNG, JPEG, BMP. You can associate the CIE with EXR files and open them just by double-clicking. Ctrl + O and Ctrl + S for fast image opening and saving. It is a portable application, works with just unpacking, no installation necessary. Improved UI of the DR Server and DR tab in the Corona VFB. Slaves now automatically gather missing assets from the master and cache them locally. 3ds Max on slaves is spawned immediately after the DR server starts – this lets slaves begin rendering much faster. DR works with adaptivity, which means faster rendering. Slaves report their current status to the master. Memory usage of slaves is reported. Slave names can be customized. DR slaves now respect VFB regions, region layout on slaves is updated every time they send the results to the master. Anti-aliasing in DR has been improved when every slave renders only a few passes. Bloom & Glare is now always disabled on Corona DR slaves, slightly lowering memory and CPU usage. Slaves found through “Search LAN” now show user-specified names instead of hostnames. Subsampling – by beginning with a “pixelated” overview of a rendered image, IR responsiveness is greatly improved. This is particularly useful when composing a scene by moving the camera or objects. Fixed freezing when using a 3ds Max Physical Camera. The scene is no longer reparsed when not needed – e.g. when changing the selected object, changing poly sub-selection, moving the mouse in the viewport in some scenes where physical cameras are present, and the first click into a viewport no longer cause IR to restart. Improved interactive rendering refresh rate (up to two times in simple scenes) – especially for a docked VFB. Added an FPS counter for Interactive Rendering (enabled in the devel/debug settings). Light color and intensity can be baked into the scene. 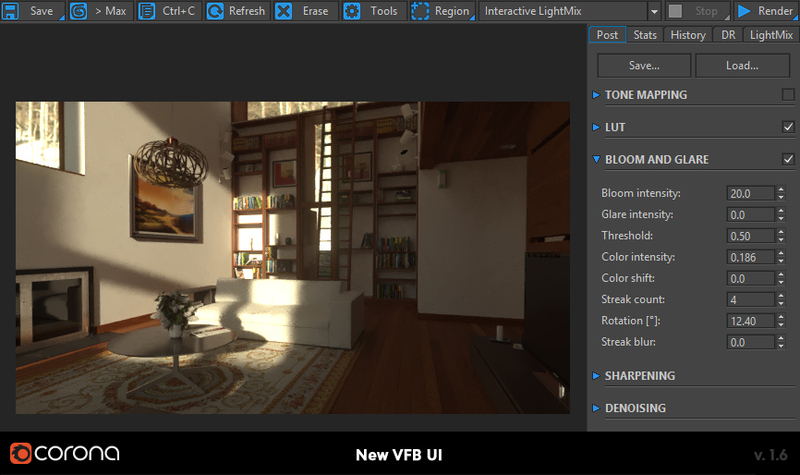 This makes LightMix an ideal tool for easily setting final lighting, instead of editing the lights and light-emitting materials one-by-one in the viewport. Improved automatic creation dialog now allows you to choose how to group lights into LightSelect layers, and whether they should be denoised. It also shows the number of elements created, and the amount of memory consumed. Light intensities stick to LightSelect elements, even when reordering. Added on/off checkboxes to LightMix groups in the VFB. Replaced “All to 0” button in the LightMix tab with a “Toggle” that switches all checkboxes on and off. LightMix is now computed in Wide RGB, the same as normal rendering, to make its post-processing effect match more closely what Corona renders. 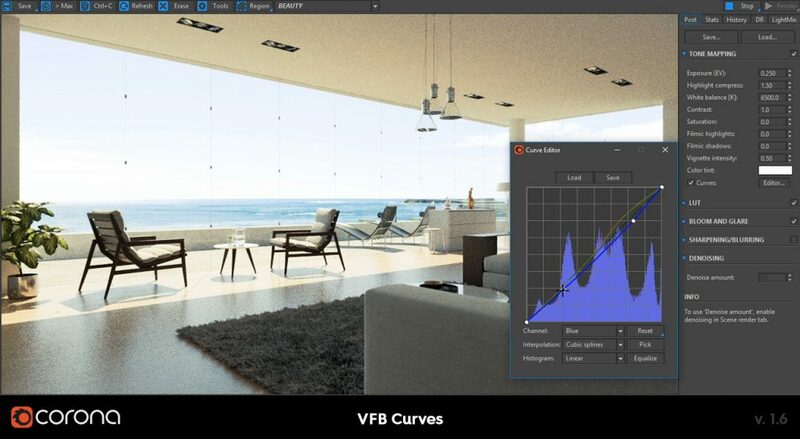 The VFB now offers custom curves with histogram so you can further fine-tune the tone mapping. The VFB now features blur and sharpen options. They are applied one after the other, first blurring an image and then sharpening it, to remove “pixel-perfect” noise and give a more photographic look to the final image. Controls in the VFB are now sorted into collapsible groups. The tabs in the VFB can be re-arranged into any order you prefer by simply dragging them. Fuzzy Render Regions let you focus processing power on a specified area without visible borders between the region and the rest of the image. This is especially useful when doing a quick preview, where some specific area has to be rendered in better quality – for example, to check if there are no anti-aliasing issues, or if the material looks as intended. They can be also combined with interactive rendering to get faster feedback. To make a render region soft, simply Ctrl+click and drag its border. The softness can be adjusted independently for each render region. 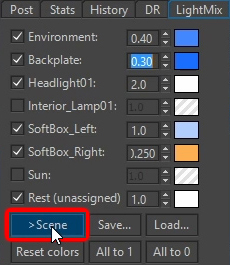 Render Regions are now saved with the scene. VFB Regions are now scaled together with the image instead of being removed on render start. The title shown in the VFB header can now be customized. This is a system-wide property that can use all the render stamp placeholders, as well as a few more. By default, it has been changed to show camera name and frame number. Each group in the VFB can be turned on or off via a checkbox. LUT selection has been incorporated into the VFB as well as in the Camera tab in the Render Setup dialog. Render Regions can be disabled and later re-enabled via a new dropdown in the VFB menu. Objects can now be scattered in regular patterns using UV mapping. There are three patterns available: Grid, Running grid and Hexagonal grid. Objects can now be scattered on open and closed splines. Increasing “Jitter” will make the distribution along the spline more random, and changing the “Offset” moves the instances along the spline. The UV channel sets which UV channel of the distribution object the Scatter uses. Users can set the spacing between instances on the spline, resulting in a regular distribution. 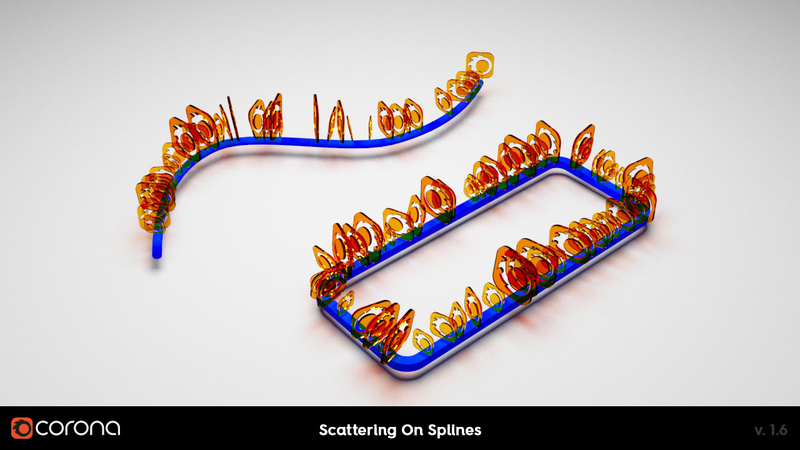 Scattering starts at the beginning of the spline (so, if the spacing is set correctly, scattered instances will reach the end of the spline). The default orientation is the local Z-axis. This can be changed by rotating the spline’s pivot, which will rotate the instances around the spline. Parameters can be keyframed for animated results (and the spline can be animated too, of course). Each transformation (rotation, translation, and scale) now has stepping values – translation steps are specified in world units, rotation steps are specified in degrees, and scale steps are specified in percent. Each transformation now has 3 checkboxes X/Y/Z to determine which axes are affected by discrete stepping. This value corresponds to aligning all instances with -Z (value -1), aligning them to the normal (value 0), or aligning them with +Z (value 1). The in-between values allow blending the aligns (e.g. a value of 0.5 will be half the distribution object’s normal, half Z axis). “Count” parameters have been moved to their respective rollouts (one for Random surface and one for BBox scattering) and “Count/MaxCount” has been changed to “Limit” which acts as the hard limit on how many instances will be scattered. UV scattering mode is only accessible for surfaces and closed splines. 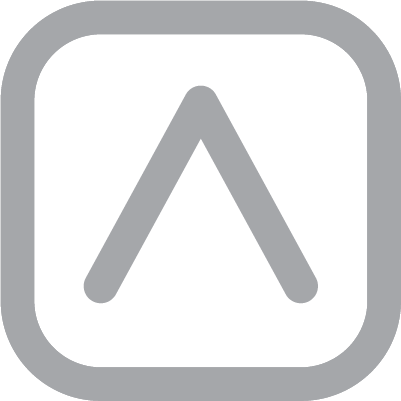 Scatter Lister script has been updated to support the new Scatter functionality. Added a Scatter Lister button. Frequency spinners and gamma randomization have been added to the Corona MultiMap. While 3ds Max does offer similar functionality in version 2017 and newer, Corona Triplanar works with all versions of 3ds Max, and with a simpler interface! The Corona Camera Mod now offers the ability to render to a conventional stereo image or animation (one that is not a 360 panoramic render). This is ideal for technical or medical illustration, where the focus may be on a single object rather than on a complete environment or scene. Added rotation in degrees to the Corona Bitmap for environment maps. Licensing Server now shows both hostname and IP of computers making requests. The official suffix for Corona EXR files is now .cxr – the defaults for autosave, render history, and saving from 3ds Max have been changed accordingly. VFB pixel probe values clarified with new naming: Original Linear RGB, Tonemapped sRGB and Tonemapped sRGB 8-bit. Renamed and re-ordered buttons in the LightMix tab. Disabled Noise limit when rendering masks only (as it does not make sense in this situation). Removed the “Clear interactive VFB” parameter as it is no longer necessary with the introduction of subsampling. Corona Lights now remember the last file location used in the IES selection dialog. Reworked the UI for the LayeredMtl. Relative error (noise level) is now shown with 2 decimal places. Removed Lighten and Darken operations from the CoronaMix map as these are identical to Minimum and Maximum operations (the names for Minimum and Maximum have been updated to reflect this). Added a clarifying warning in the CoronaOutput map settings dialog, that “Affected by color mapping” is not compatible with changing post-processing during render. Added tooltips to the Corona Color Picker. Opacity cutout (clip) checkbox in Corona Material changed to be off by default. Corona buttons are now drawn with a different color when disabled. Replaced the Corona logo in an interactive docked viewport with the “Options” button. The “Setup LightMix” button is now greyed-out while rendering. Added a clarifying message when the Material Editor preview is disabled in interactive. Low memory warning now shows more detailed information. .conf parsing error message now shows the location of the problematic file. Out of memory error message has been improved. Long dropdowns in VFB render passes select are no longer clipped by the bottom end of the VFB window. “Prevent black appearance” for Corona Lights and CoronaLightMtl is a new option that will avoid them showing as black when light constrained by Directionality or an IES profile does not reach the camera. Support for the 3ds Max native 2D Pan Zoom Mode has been added. It is especially useful when combined with interactive rendering and can be used to, for example, fine-tune materials or object position. 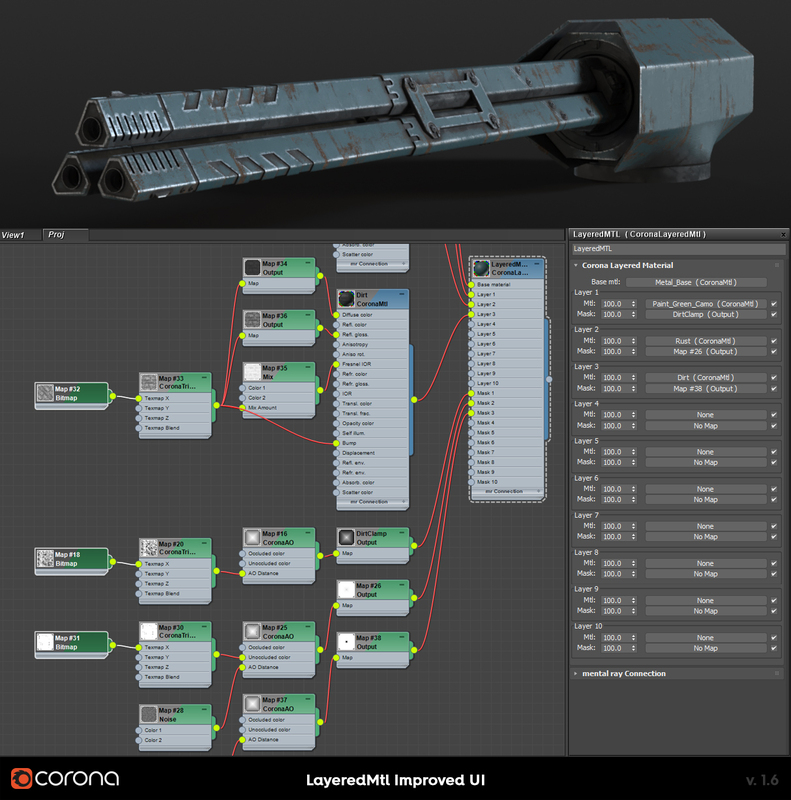 The new Corona LayeredMtl UI allows for adjusting the strength of any masks applied to the layers, for greater flexibility in creating layered materials. Kim Amland (known on the forum as Dubcat) kindly provided three LUT files to help achieve a truly photographic result in your renders! The three LUTs were created using actual cameras – they represent the process which a camera applies to the RAW image right after capturing it. 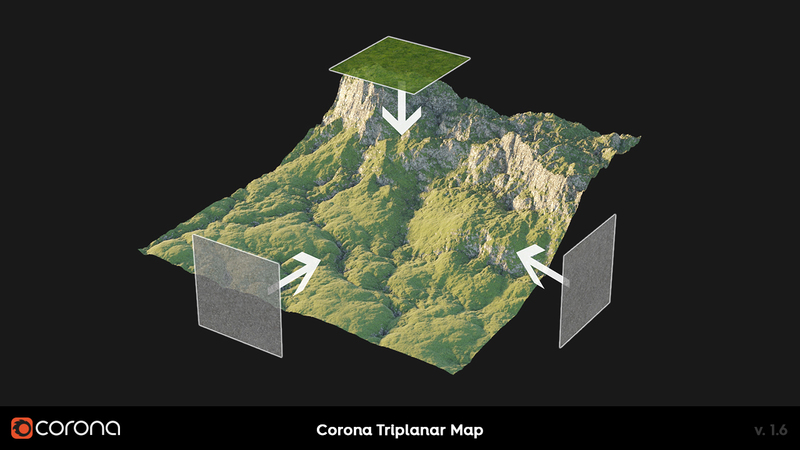 The CoronaMix map now works with bump mapping in all modes, properly blending individual maps. LUT parsing is now 3-5 times faster. RAM usage is greatly reduced when using deformable motion blur. Recently used LUTs are cached in memory to allow faster switching between them. Added “Resume Last” and “Resume File” buttons to the Corona VFB “Render” button dropdown. Changed the default VFB history folder size on disk limit from 512MB to 2GB, as 512MB proved to be too low. Vignette is now automatically disabled when using a spherical, cylindrical or cubemap camera. Vignette is now applied before other tone mappings, resulting in an improved and more dynamic look. Increased maximum vignette strength to 10 to allow for a stronger look. 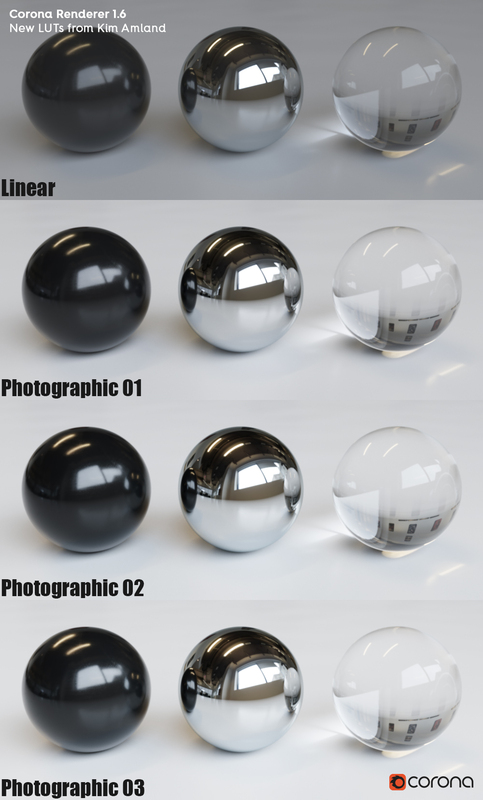 Lowered memory requirements of denoising render elements. 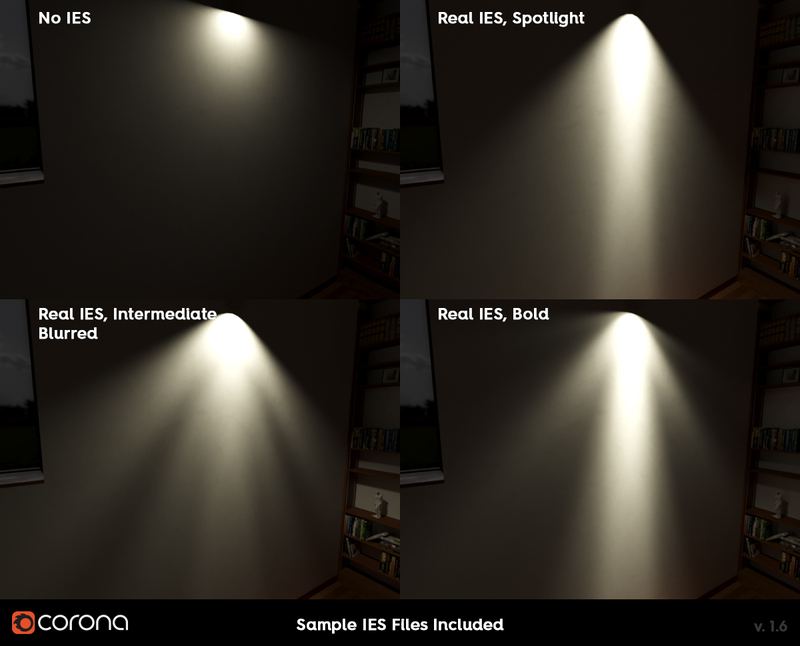 “Remove fireflies” denoising mode now works for render elements. Denoised render elements are now displayed as soon as ready, one-by-one; Corona no longer waits until all denoised elements are computed. The previous denoised image is no longer destroyed when re-rendering only a region with clear VFB off. Corona Distance map now properly handles particle objects. Corona Distance map now works in the bump slot. 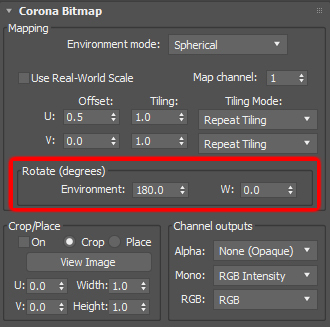 Corona Distance map now shows a warning in the render when no “Distance from” object is defined. The Corona RoundEdges map now gives significantly improved results, even closer to that of modelling rounded edges. It also works in other slots than bump now. Bloom and Glare now properly handles the left-right seam in 360-degree renderings, and tries to approximate the deformation near poles. The Albedo render element now shows “low albedo” areas highlighted in blue, along with the “high albedo” areas shown in red. The thresholds for high and low albedo can be manually adjusted. Reduced the Corona AO map default Samples parameter, since the new sampler is more efficient and the same quality is achieved with fewer samples. Added falloff to WireTex map, and now it can be used as a bump map. Estimated time remaining to complete a render is now computed when rendering to a specific Noise level. Mirrorball and Cross environment types added for using bitmaps in those formats as Environments. Bloom and Glare defaults have been changed to better-looking ones. Added individual Enable Bloom/Glare checkboxes to render elements. LUTs no longer clamp overbright values, instead, they extrapolate, as can be seen when working with the images in external post-processing applications. Updated the CoronaConverter script to version 1.33. Added Gamma control to the CoronaOutput map. Added sRGB (Photoshop-matching) invert option to the CoronaOutput map. Added linear exposure to the CoronaOutput map. Installer Unpack behavior improved: now it unpacks all files to the folder where the installer is stored, and then opens that folder. Added support for 3ds Max stereo camera plugin. Improved the way expanding variables in autosave works – for example, now it is possible to use D:/autosave/%f/autosave.exr to save each scene autosave into a different subfolder (with subfolders created automatically). Autosave now creates folders automatically when set to use a folder that doesn’t exist, rather than failing. The internal 3ds Max name for Corona changed to just CoronaRenderer so that every version of Corona can be invoked from maxscript using the same command. Added new render stamp variables: Corona build name (%bn), preprocessing time (%ptp), and a number of CPU threads (%ct). System-wide settings are now versioned to rule out conflicts when changing between daily builds and stable release versions. Fixed cubemap + blowup + displacement rendering. Added lens distortion support (3ds Max physical camera) – both cubic and texture modes are supported. Render To Texture can now have denoising applied. 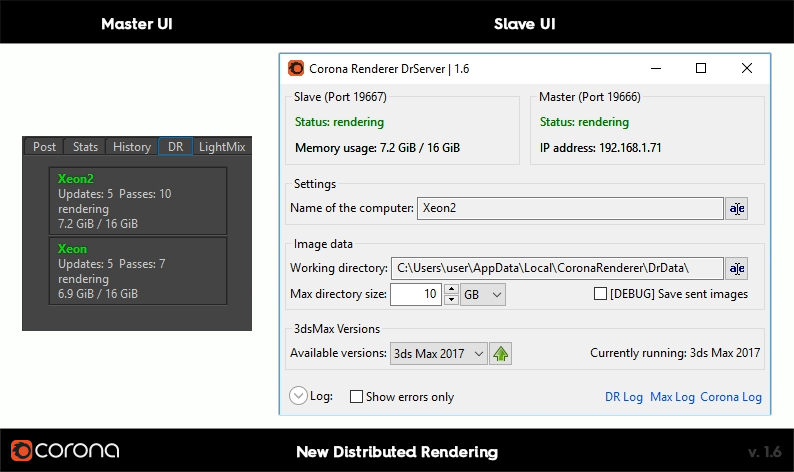 When running multiple instances of 3ds Max with Corona, all 3ds Max instances will now produce their own log files in differently named files, instead of all but one discarding their logs. Added object space normal and object gradient modes to the CoronaData map. Flipped the channel output in object space normal and object gradient modes of the CoronaData map to improve compatibility with Allegorithmic’s Substance Designer. Added Gbuffer override to LightMtl (for more than 16 values). 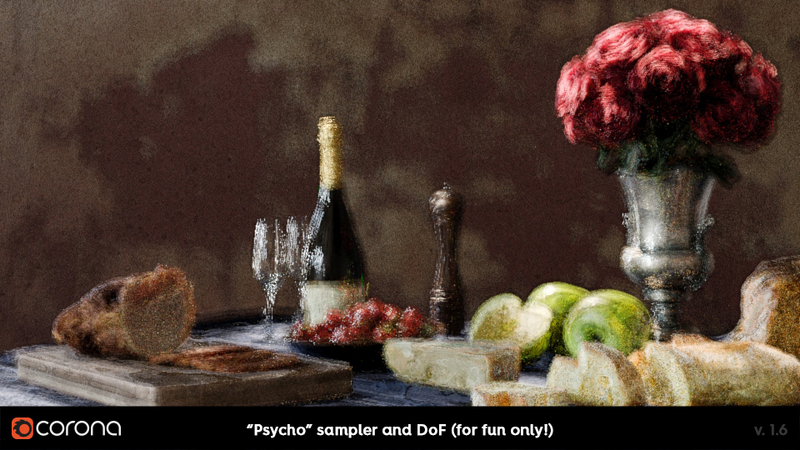 Added Psycho random sampler – this is not intended for production renders, but included purely for fun and creative use! Terminator fix – Jagged edges at shadow terminators have been fixed. These were particularly visible with low poly objects, or when bump mapping was used. Controls for this are under the devel/debug settings, but the defaults should work well so you should have no need to look for those settings! Fixed: Incorrect motion blur value used in IR when rendering with a physical camera. Fixed: Crash when starting IR without Corona being selected as the production renderer. Fixed: Slow IR update rate when using the 3ds Max Physical Camera. Fixed: Crashes when resetting a scene when Interactive Rendering was running. Fixed: IR not updating when changing F-stop. Fixed: Shift+Tab not working on some elements in the Corona VFB. The TAB key in Corona post-processing VFB tab now goes through all adjustable controls. Fixed: Slow pixel probe in Corona VFB when using bloom & glare. Reduced flickering of the stats VFB panel. Fixed: Bloom & Glare not updating in the docked interactive VFB. Fixed: Bloom & Glare on/off checkbox state not loaded when using Save and Load in the VFB postprocess tab. Fixed: Corona VFB history showing black images when used with region render. Fixed: Render regions in the VFB not updating in some rare cases. Fixed: Drawing of VFB render regions when a 3ds Max render region is also used. Fixed: Crashes when rendering with a 3ds Max render region and zooming in the VFB. Fixed: Corona VFB sizing on 4k monitors. Fixed: Clicking on the Tools button in the VFB to hide the tools, and then clicking the button again to show the tools, did not return the VFB to exact previous size. Fixed: Denoising crashes when out of memory – instead, an error message is displayed. Denoising is now properly disabled when rendering only elements. Fixed: Denoising values from the last render remaining on screen during the next render. Fixed: Denoising turning image out of render regions black. 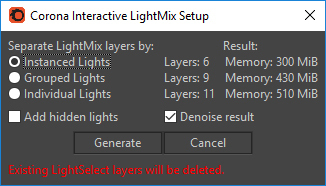 Fixed: Lights not assigned to LightSelect render elements correctly when using only LightSelect render elements without a LightMix render element. Fixed: LightMix channel not working with A/B history. LightMix setup now no longer creates layers for lights from x-reffed scenes, as those do not save properly anyway. Fixed: UHD cache sometimes reporting NaN stats. Fixed: Corona autosave not working with UNC paths. Fixed: Incorrect characters sometimes appearing in autosave filenames, disabling the autosave. Fixed: Autosave not accepting folders with spaces in them. Fixed: Images saved black when rendering regions and saving to an image format with transparency. Fixed: Crashes when 3ds Max bitmap is changed on HDD during/after render. Fixed: Corona EXR opening in Photoshop (and took safety measures so it won’t get broken again in the future). Fixed: Corona EXR and Corona jpeg not saving sequences properly. Fixed: On some machines, Corona kept reactivating and crashing when opening the Material Editor. Fixed: Crashes when using Xreffed CoronaSun. Fixed: Bug causing CoronaSun to be a bit smaller when textured. Fixed: Animated on/off button in CoronaLight/Sun was ignored. Fixed: Crash, when a scatter with over 2 billion polygons, was plugged into a Corona Distance map. Fixed: Corona Distance map + animated objects do not update properly in animations. Fixed: Corona materials not updating in the viewport when properties are animated and the time slider is moved. Fixed: CoronaBitmap and other animated maps not updating in the viewport when scrubbing timeline. Fixed: Animated “Enable scatter” button. 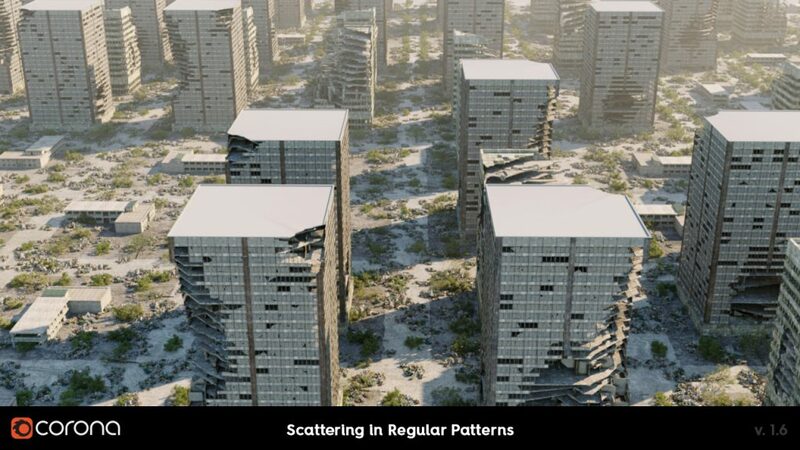 Fixed: Setting Scatter Density to 0 did not actually remove all instances. Fixed: Scatter not updating with an animated texture map. Fixed: Crash when using bloom & glare on a 1*1 pixel render. Fixed: Bloom & Glare temporarily displayed on the non-matching image when moving a camera in IR. Fixed: UI freeze when using “Lock 3ds Max during render” with RTT. There is a bug in RTT, so we had to disable the lock for it. Fixed: Displayed “Element Type” in the RTT UI for Corona render elements. Fixed: RTT sometimes saving to an incorrect location. Fixed: Crash when NANs were produced in a scene using LUTs. Fixed: NANs under specific conditions. Fixed: NaNs in some cases of extremely motion-blurred lights. Fixed: Freezes when using GrowFX. Fixed: parsing issues with animations, improving e.g. PhoenixFD compatibility. Fixed: Crash when RoundEdges map was plugged into opacity slot. Unified Corona prompts and info popups (message boxes). Fixed: Crashes when using 3ds Max native VectorMap. Fixed: Rare crash in Render History. Fixed: Crash when closing 3ds Max on some computers. Fixed: Some LUTs not loading. Fixed: .conf error popups on startup when running Corona under windows user with Unicode name. Renderstamp now fully supports Unicode. Fixed: CoronaWire not working with deformable motion blur. Fixed: Instancing not working on objects with deformable motion blur. Fixed: Issues with point cloud display (with a little performance drop in viewport). Fixed: Indexed color bitmaps loading incorrectly in CoronaBitmap. Corona Standalone: improved error messages on duplicate materials. Corona Standalone: Improved error message when the user tries to save to .hdr format (which is currently not supported for saving). Corona combo box now has a scrollbar if enough items are present. If you’ve been a Corona user for a while, you’ll know that as soon as we release one version, work starts immediately on the next! Which means that work has already begun on 1.7 – you can check our initial plans (not exhaustive or final yet!) on our roadmap at https://trello.com/b/EfPE4kPx/corona-road-map-3ds-max. 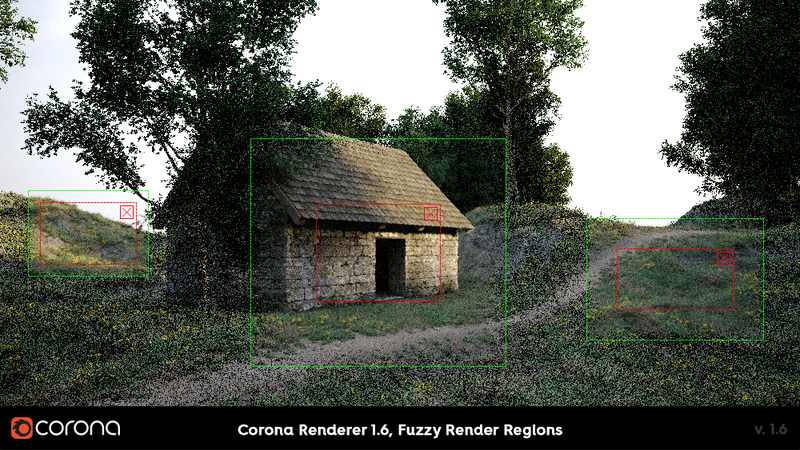 And as you can already guess from the roadmap, Corona Renderer 1.7 will be focused more on VFX features. And for those brave ones who read the entire article before downloading, here’s that download link again – because it’s a long way back to the top! Terminator fix and VR glare fix are very welcome! Im very gratefull corona is free for learning, after years of struggle with other render solutions corona shines as the best I’ve found!! And with every update there is more control with less efford.